Unprecedented numbers of pregnant women are seeking medical care at an MSF hospital following funding cuts. Meet Cherline, one of our patients. Cherline is eight centimetres dilated already and has very high blood pressure when she arrives at the Médecins Sans Frontières Centre de Référence en Urgence Obstétricales (CRUO) hospital on 16 October. She is taken immediately from the triage area to the delivery room. But her delivery stagnates, her dilation even reducing to seven centimetres. She is moved out of the delivery room to another bed. She pushes through her labour for seven hours. It is taking a long time, and she explains to the nurse that she does not understand why. 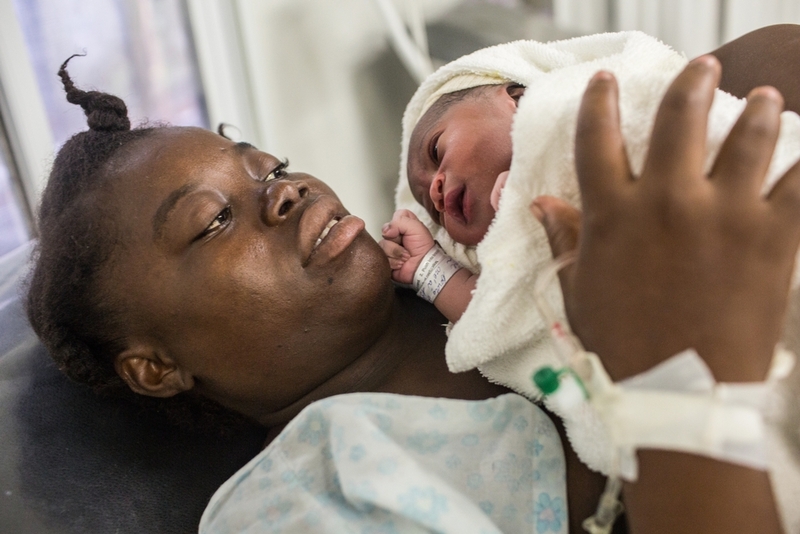 But suddenly, it happens: Cherline is brought back to the delivery room, joining two other women also in labour, and gives birth to a healthy baby girl. Her baby is taken to the examination table, wrapped up tight and placed under warming lights. The medical staff put a yellow ointment under her eye lids to prevent eye infections that can occur during delivery. The next day Cherline is transferred to another ward for monitoring. Clercy, her husband, visits her regularly, holding the baby with a slightly bewildered look on his face. When the baby cries, he lulls her clumsily, but she does not stop. She is hungry. Cherline breastfeeds her, but finds the first attempts are painful. The nurse gives some advice. Cherline and Clercy decide to name their daughter Esther Clercy, and the next morning Cherline, Clercy and Esther go home. Clercy shelters his wife and newborn daughter from the sun with two new umbrellas, still with tags on. They board a tap tap – a type of microbus. It is very crowded, but the passengers move to allow Cherline to sit in the front with Esther. They disembark at the police station, and walk under their umbrellas to a refugee camp built after the 2010 earthquake for people made homeless. It is a long walk on an unpaved road in the midday heat. Clercy takes the baby and walks a little ahead, eager to get her home: a 15 square metre shelter with metal sheeting for the walls and roof. On the right side is a bed, on the left side a small table. Their possessions are in one cupboard. Inside is even hotter than outside. Cherline lays her baby down on the bed. She is happy to be home.